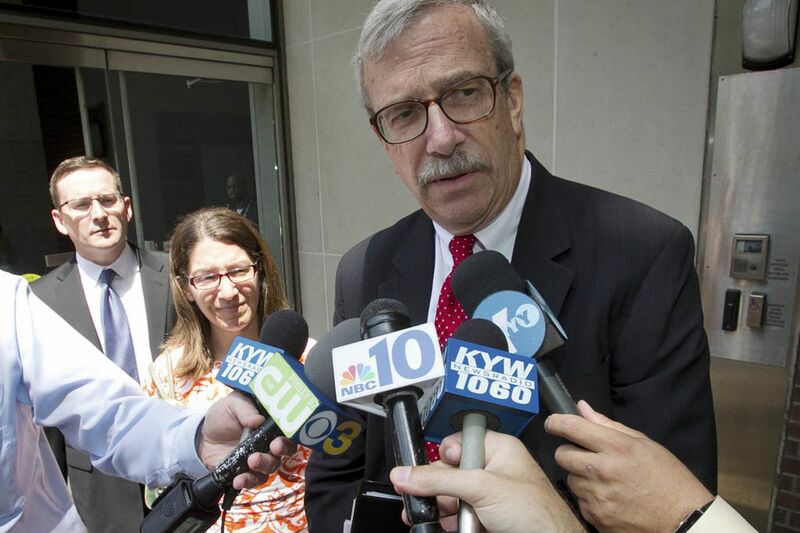 Prosecutor Anthony Wzorck outside the U.S Courthouse at Market St. and 6th St., after the verdict was handed in on the Philadelphia Traffic Court corruption case. AFTER TWO days of deliberations, a federal jury acquitted six former Philadelphia Traffic Court judges of corruption and fraud yesterday, debunking the government's claims of judicial dishonesty and ticket-fixing. In count after count, U.S. District Judge Lawrence Stengel read "not guilty" from the verdict sheet to a packed courtroom. Sobs of relief echoed from the gallery from family and friends of former Traffic Court judges Michael Sullivan, Michael Lowry, Robert Mulgrew, Willie Singletary, Thomasine Tynes and Mark Bruno. Four of the judges - Tynes, Lowry, Mulgrew and Singletary - were convicted of lying to law enforcement or of perjury when they were questioned by a grand jury more than a year ago. The remaining two, Sullivan and Bruno, were cleared of all charges. Bruno, a magisterial district judge from Chester County, had served on the Traffic Court bench only a few times a year as a substitute. A seventh defendant, Robert Moy, owner of a Chinatown translation business, also got off scot-free, having been charged with being in cahoots with two of the judges who allegedly fixed tickets for his clients. The jurors, a mixed group in age, gender and overall demographics, returned the verdicts unanimously and were thanked by Stengel, as well as by each defense attorney during closing arguments. The jury had sat for more than two months in federal court as the case unfolded. "The jury's verdict is a resounding statement on the limits that should be placed on the federal government's discretionary power to prosecute," said Paul Hetznecker, attorney for Moy. "In this particular case, we've said from the beginning that this was an overreaching prosecution. The government went far beyond what we believe should happen in a democratic society." After court adjourned, family and friends exchanged hugs, while Assistant U.S. Attorneys Denise Wolf and Anthony Wzorek escaped questions from reporters. Neither could be reached for comment. "This case was about a corrupt Traffic Court system and corrupt judges, and obviously the government struck out on that," said William J. Brennan, Singletary's attorney. "Did they get Willie for talking to the FBI? Yeah, OK, it's [like] kissing your sister." "I'm just grateful for what God has done and what he has done in my life," Singletary said as he left court. "This is a win for Thomasine Tynes," said her defense attorney, Lou Busico. "She was accused of manipulating the judicial process, and this jury unanimously rejected that." William McSwain, Bruno's attorney, also expressed gratitude for the outcome. "Judge Bruno is very relieved," he said. "It was a complete repudiation of the government's case. "He is a sitting judge who's been suspended during this proceeding, so we're hoping that soon he can take the bench again. That's the next thing we're concerned about." Sentencing is scheduled in 90 days. Perjury, a third-degree felony, is punishable by up to seven years in prison along with hefty fines.